First: What Is UX Writing? UX writing is a form of copywriting that guides a user through a process, series of tasks, or product and improves their interaction with it. UX writing shares some similarities with copywriting, but they are not the same thing. Both styles of writing are concerned with helping people better understand, and thus want, a certain product. The biggest difference is that copywriting happens after the product is a finished design. That’s not the case with UX writing. UX writers help facilitate a good customer experience with their words. This can mean anything from a drop-down menu, to an error page, to instructions posted on a website. Words create the difference between a confused and frustrated user and one who understands and is happy with their decision. What makes this kind of writing so effective is that the content creators are usually an important part of the design team. So instead of trying to cram all the important info into a word count limit later, content is a priority during the design process. 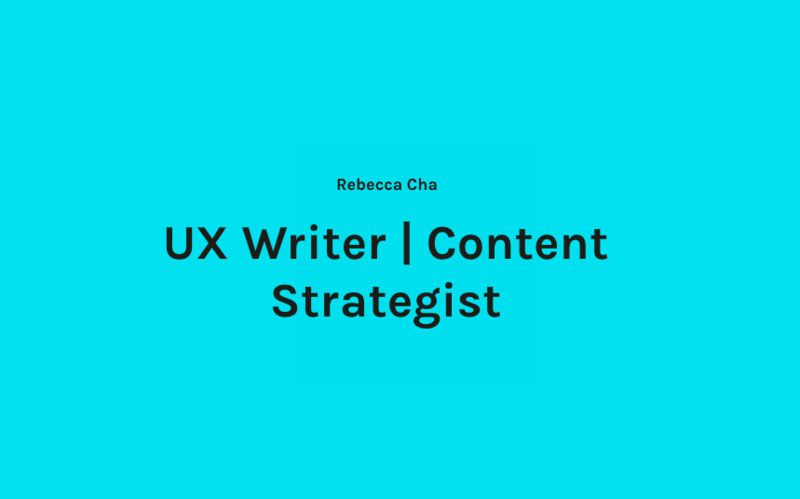 UX writers are also uniquely positioned in terms of understanding the products and services they write about as they know the frustrations the customers deal with along the way. Remember to curate your UX writing portfolio with the end users in mind: think of potential employers as you would another user. What kind of impression do you want to make? “You can use a magazine style layout, a modular layout, or whatever you think will play to your goals and strengths. Use imagery to show off your previous UX projects and accomplishments. Try using before and afters to show off your skills at simplifying writing into simple, visually oriented UX writing,” suggests Claire Tate, a UX writer. Your website is another element of your portfolio – this shows how good of a job you can do. If your website is poorly designed for readers, you will appear unprofessional and your portfolio content won’t help. Get in the mind of the customer – recruiters, employers – and design for them. Your UX writing portfolio has three main goals: to explain a customer issue, demonstrate what your process is, and then illustrate what the finished solution will be. Communicating all this with words instead of visuals isn’t easy, so it’s important that you’re skilled with giving people the information they need within some significant restraints. In fact, that’s kind of what UX writing is all about. Clear and effective communication is a huge part of what will help you succeed as a UX writer. You should learn how to make your writing concise. Yes, you have a bit more freedom as a UX writer, but you still need to learn how to write as simply and efficiently as possible. There is only so much room on a computer screen, and it gets even smaller when you’re looking at mobile devices. It’s also crucial you know how to communicate diplomatically with the user. When a person comes across an error screen, the last thing they want to experience is a patronizing or confusing message. All that will do is frustrate and anger your customer. Learn how to write copy in a way that achieves this, while also maintaining the brand’s voice and personality. If you don’t have strong examples for your portfolio, use real life examples that have frustrated you as a user and demonstrate how you would improve them. Put yourself in the user’s position. Look at the screen and ask yourself, if I hadn’t been involved with the design of this product, would the communication here be enough for me to understand and navigate? Identify friction points and smooth them over by providing extra information and guidance. Soft skills are particularly important in any job that is focused on communication, and UX writing is no exception. You should be good at working in teams and coordinating with members from different disciplines. A UX writer spends a lot of time in meetings, planning and collaborating with other people. You should be able to articulately explain your ideas and also how those ideas connect with work being done by other team members. While you don’t need to know how to code, you should be willing to learn the basic concepts of complementary skill sets. Part of your job as a UX writer will be working alongside designers and developers, so pick up as many technical skills as you can. Make yourself comfortable with agile processes and other development theories. Get familiar with the actual UX design process and A/B testing software used to determine how users feel about potential solutions. Learn how to use prototyping tools. There isn’t a specific UX writer degree, but a degree in English or technical writing is often preferred or even required by employers. You can make yourself a lot more attractive to an employer by picking up knowledge and experience about areas such as digital marketing, project management, data analytics, web design, and product development. Your first concrete step towards becoming a UX writer is developing your skill set or adapting your existing skill set to the job. Look around at existing UX writing or the above list of industry portfolios, and see what you can learn. Notice how easy (or not so easy) these sites are to navigate and look for places where good UX writing is facilitating the experience. Learn by paying attention to how written content enhances, or detracts from, the user experience of your favorite products and services. Watch your word choice and learn the difference between being helpful and being annoying to the user. Then begin incorporating those examples (good, bad, and how you’d fix them) into your UX writing portfolio.